Pregnancy photographer in Lausanne, Vaud, Switzerland, LunaCat Studio accompanies you before the arrival of your beautiful baby with a maternity portrait session. During pregnancy, we think mostly about baby who is coming and we often forget to fully enjoy this maternity time, so ephemeral and unique. Even knowing it, every pregnancy is different and some future moms forget to get photographed during their pregnancy. Hiring LunaCat Studio as your newborn photographer is making the choice of high quality images created by a professional photographer to ensure you will have timeless memories of your couple or family during your pregnancy. Your child will thank you for choosing to work with a professional pregnancy photographer such as LunaCat Studio when you will be able to share with him those beautifully created images some years later! Discover LunaCat Studio pregnancy photos for more maternity images. 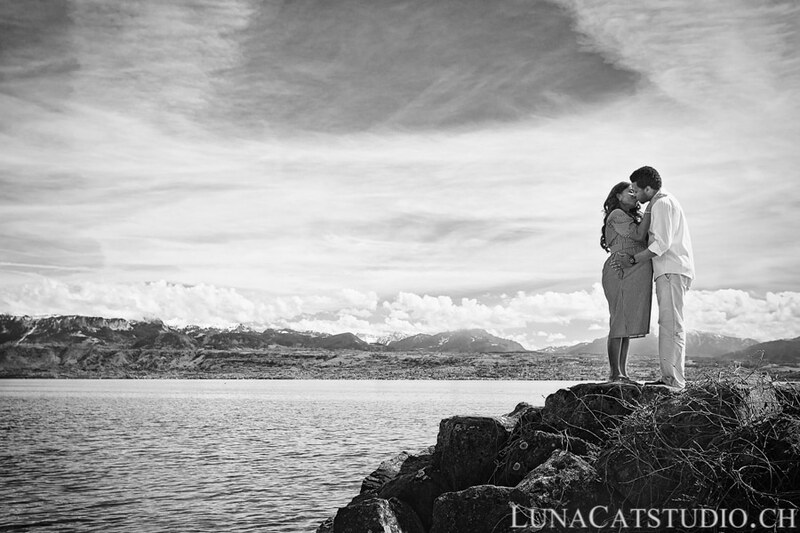 LunaCat Studio is a professional photographer specialized in natural style pregnancy photography. To tell you the truth, it is a personal photography choice, I just want future moms to feel beautiful while being able to recognize herselves on the pictures. We always tend to, as women, physically lower ourselves and pregnancy is such a special time for a mom. Who has never heard a mother saying she looked like a whale at the end of pregnancy? And yet, a future mother shines with an aura of beauty that I love to capture through my photo lens. Being a fan of natural beauty and nature itself, I have a particular attraction for outdoor pregnancy photo shootings. It is also a very good choice if you already have children, who will also be much more comfortable outdoors playing with you in front of my camera, producing natural and beautiful images! Of course, we can also make maternity images indoors at your home thanks to my mobile photography studio versatile pregnancy photographer if you prefer ;). Pregnancy photographer: how much does a maternity photoshoot cost? Pregnancy photography can not be improvised and requires a lot of experience to highlight the curves of the future mother and put at ease the people photographed. Unless you are a professional top model, but it is not often the case with my clients. And almost everyone is afraid to be photographed, especially as a pregnant woman. It is in this situation that being photographed by a pregnancy photographer is important for images to fully reflect your natural beauty. This professional quality for your pregnancy photos can be seen as costly, but this experience is unique in your life and you will love it when you see the result. Unfortunately, it is often after pregnancy that we regret not having hired a professional pregnancy photographer for such a special moment. After the arrival of your baby, it will be impossible to rewind the time to make a pregnancy photo session. You can read my clients’ testimonials to learn more about the unique photographic experience at LunaCat Studio. Also, if you book at the same time a pregnancy photo session and a newborn photo session, a discount is offered on the pregnancy + newborn pack. After booking your pregnancy portrait session, I can give you tips to best prepare for the pregnancy photo shoot. For example, which pregnancy clothes to wear for best comfort. You are accompanied professionally throughout the process before, during and after the maternity photo session so that this experience is unique for you and your entire family. Our interest is to provide you with a wonderful experience before the arrival of baby and to keep imperishable memories, both in your memory and on photo paper. For any question regarding pregnancy photo session pricing and availability, do not hesitate to contact me. Pregnancy photographer: when to book? Although some pregnancy photographers give you a define date when it is better to make your pregnancy photoshoot, you are, as a pregnant woman, the best person to determine the right time for this pregnancy photo session. To explain it fastly, each pregnancy is different. Your pregnant belly will grow more or less quickly and this greatly affects the best time to make your photo shoot. Some pregnant women see their belly grow at 6 month pregnancy, other expectant mothers have their belly grow after 8 months in their pregnancy. In short, you have understood my point, the idea is really to listen to yourself and get photographed when you feel the best as a pregnant mom during pregnancy. As a pregnancy photographer, I find there are significant differences between future mothers and you have to listen to yourself and I adapt myself to photograph you at the time of your pregnancy where you feel good in your curves with your baby bump. Thus, you will understand that my availability as a pregnancy photographer is limited in order to provide high quality photographic services to my clients and to adapt to the period that suits you best to photograph your pregnancy. Also, outdoor photo shoots require “B plans” for the tricky weather that goes sometimes wrong. This is why I limit the number of pregnant women photographed per month, so booking your seat is essential. I advise you to book your place for a pregnancy photo session early in your pregnancy to ensure availability. Pregnancy photo session: how does it work? 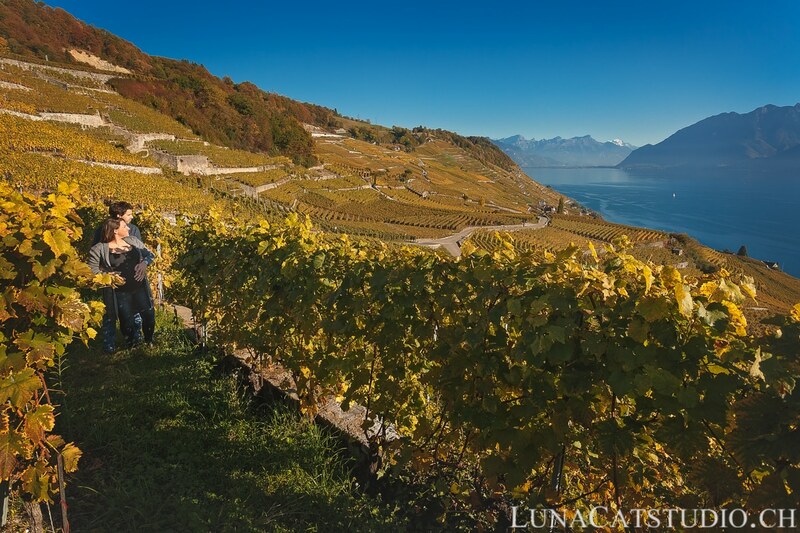 As a pregnancy photographer, LunaCat Studio travels throughout the French-speaking part of Switzerland to make your pregnancy photo shoot in different environments thanks to the variety of beautiful landscapes that Switzerland offers. How lucky I am as a Vaud pregnancy photographer to be able to photograph beautiful families in such landscapes! The pregnancy photo session lasts an hour, so that we have the time to enjoy the environment without running everywhere. You will not see the time passing by! 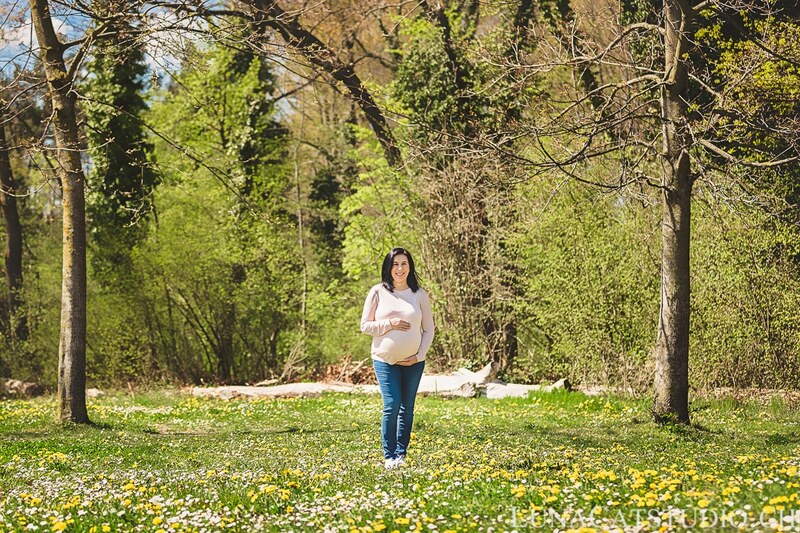 If you want to see more pictures of pregnancy, do not hesitate to discover the last pregnancy photo sessions posted on the blog, such as a maternity photo shoot on the shores of Lake Geneva, and pregnant woman photo in Lausanne. LunaCat Studio is a pregnancy photographer based in Lausanne in Vaud, Switzerland and travels to photograph your family during your pregnancy in Vaud, Geneva, Vevey, Montreux, Fribourg, Neuchâtel and Yverdon but also in France and the rest of Switzerland. For more info on the pregnancy photographer LunaCat Studio, please go to www.lunacatstudio.ch/en.